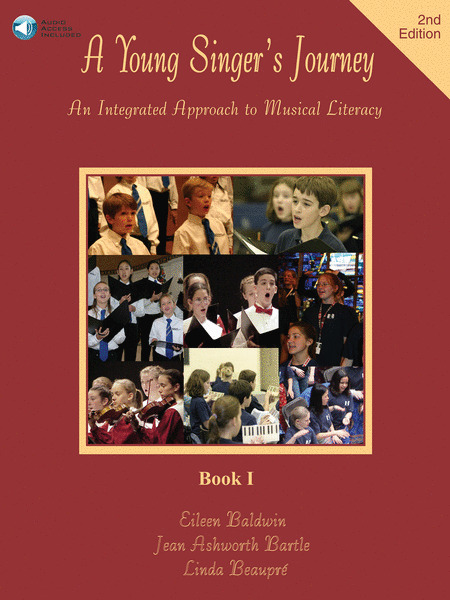 A Young Singer's Journey consists of six workbooks and accompanying online audio files, a booklet of sight-singing and warm-up exercises for each level. Flash card masters, designed to correlate with the material presented in each workbook, are also available. Contact the publisher regarding further aids to the curriculum. Children learn at different rates and each child will approach these books with a different skill set. A child who completes three pages per week could complete two books per year, or six books in three years. A younger child may work more slowly and an older child may be able to complete the books with little teacher-direction at a faster pace. The marking pages at the front of each book have columns for written comments and a sticker reward for each page. The column for ticker rewards is meant to be used only after a page is completed, including all corrections. The marking pages will reflect the child's progress and show at a glance the pages that need more work. Most pages include audio tasks that should be completed with the pages. The CD's reinforce and further teach the concepts on the page while training the child to hear and use the written material. At the end of each track a "secret word" is given. The child should write this word beside the audio track number to show that he or she has listened to it. Bullets highlight the written tasks on each page. Children are invited to check off the bullet for each task as it is completed. A certificate at the end of each book may be signed by the teacher and awarded when the child has completed the book. The warm-up exercises include syllable songs, jingles, and exercises using the finger staff and keyboard. Memorization and accuracy of these exercises could be tested during pre-rehearsal activities. Choristers should be encouraged to practice warm-ups; a box is provided beside each example to add a sticker reward for those who perform them well by memory.